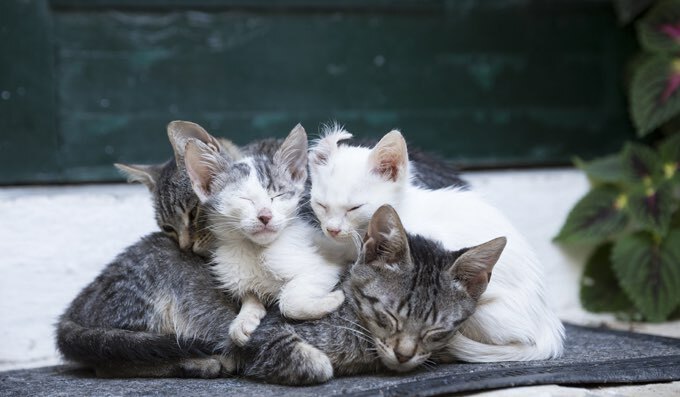 Every spring stray cats across America and around the world give birth to thousands of kittens in our neighborhoods and cities because they have not been spayed or neutered. This creates a flood of kittens and feral mama cats into local animal shelters and rescue groups. You can help save these kittens and their mamas by making sure your own cat is spayed or neutered. Encourage your friends, family and others to do the same. Adopt cats and kittens from shelters and rescues. Donate time, money or supplies to local animal rescue groups. Participate in a TNR program. Contact a rescue group if you see or find a stray cat, kitten or kittens. If you come across a new litter of newborn kittens please do not touch them if you can help it. Don’t just take them to a local shelter. Stop, let’s think about this a little bit. Kittens under four weeks old have a better chance at survival with their mother where you just found them according to Rich Anderson, executive director/CEO of Peggy Adams Animal Rescue League. Taking a kitten to the shelter at this stage might do more harm than good. Try to keep the kittens with their mama until they are eating solid food. The milk of their mother contains antibodies that will help the kittens to grow up strong and healthy and her love and care will teach them what they need to know to be grown up cats. Once the kittens are eating solid food is the time to take action. Capture or trap mama and her kittens and bring them inside. It’s best to keep them separated from other cats you may have until you can get everyone checked out by a vet. You’ll want to make sure mama and her kittens all get spayed, neutered and vaccinated. The kittens could have fleas or worms and you’ll need to get that treated or cared for. Once they are happy and healthy, then you’ll want to make sure they all find loving homes. One step at a time! Try to keep mama with the kittens. If mama is not friendly you may have to trap her to get her spayed and vaccinated before you release her back to her outdoor home or you’re going to have more kittens in the future. Feral cats are happiest living in the wild and as long as they aren’t reproducing or spreading disease, that’s okay. Reach out to local rescue groups and shelters, get as much information as you can about the realities of what needs to happen next. Can a rescue help you? Does the local shelter have room? You can always use crowd funding websites to help raise the money to take care of the medical costs of your new feline family. Do you have any other advice for people who have found a stray kitten or kittens?